We have a lot of skateboard graphics heroes in our world, starting with Jeff Philips ine the late 70's. 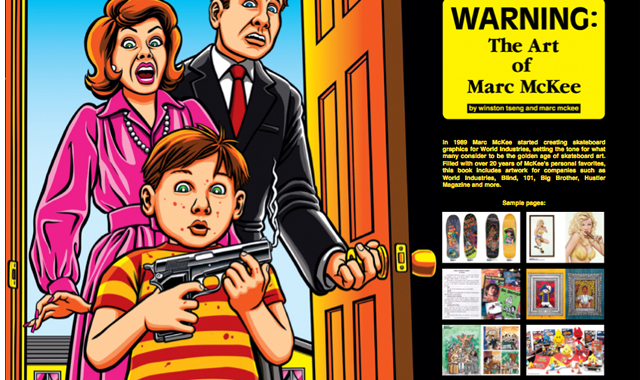 One of them is Marc McKee who started creating skateboard graphics for World Industries in 1989, setting the tone for what many consider to be the golden age of skateboard art. Filled with over 20 years of McKee's personal favorites, this new book includes artwork for companies such as World Industries, Blind, 101, Big Brother, Hustler magazine and more. The Art of Marc McKee marks the first installment of the Seen Unknown series edited by Winston Tseng, art director for Enjoi Skateboards. Tseng has worked with some of today's most genre-defying visual artists and designers whose work extends well beyond skateboard culture. With Seen Unknown, Tseng unifies the diverse range of work by some of his favorite artists, putting it all in one place for readers to enjoy.